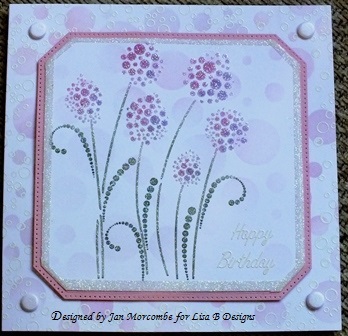 Todays little card is my take on the class card from the last workshop. I did this one at home and decided to use some different mediums. From out pack I took the 6 x 6 card and placed the Sweet Poppy Dotty Flower stencil on, held down with stencil tape and dabbed through with Pan Pastels in Pink and Lilac tones for the flower heads and a green for the stem. I wanted to see if the card would hold the colour of the Pan Pastels once the Soft Form Relief Paste - Transparent was spread through. I cleaned the stencil before spreading with the paste. After carefully removing the stencil I used the straw and glitter technique to carefully cover the whole image, I used Glamour Dust Crystal for this then left the whole thing to one side to dry. Meanwhile I took the 7 x 7 card and used the Imagination Craft Bubble stencil with Spun Sugar and Dusty Concord Distress Inks very randomly moving the stencil around to cover the whole card. 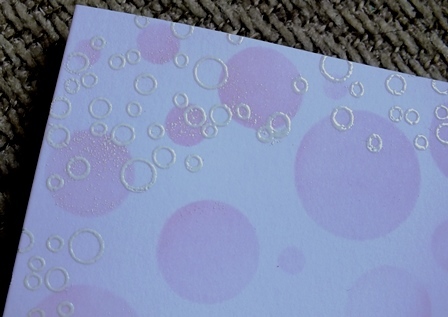 I then used a cute little bubble stamp I have in my stash with Versamark and Wow Bright White Embossing Powder and stamped all around the edge of the card. 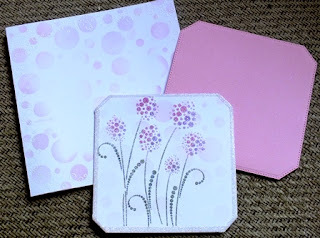 Once the stenciled image was dry I thought about using a couple of dies from my stash for a change so cut the image out first then cut a larger shape in a light pink shade of the coordinations card stock. Then took some double sided tape all around the edge of the card and glittered with Glamour Dust. 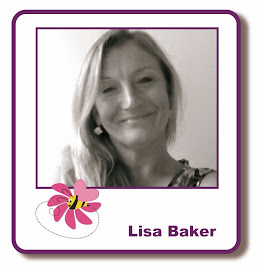 Then simply mounted the image onto the pink card then used mounting foam to place the image in centre of the card. 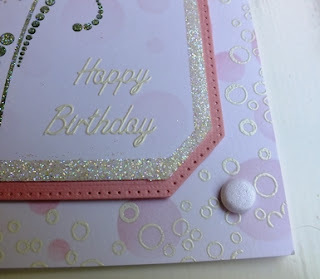 Finished it off with a white Happy Birthday sentiment and some Meringue Card Candy. Here's a close up of the corner of the finished card. 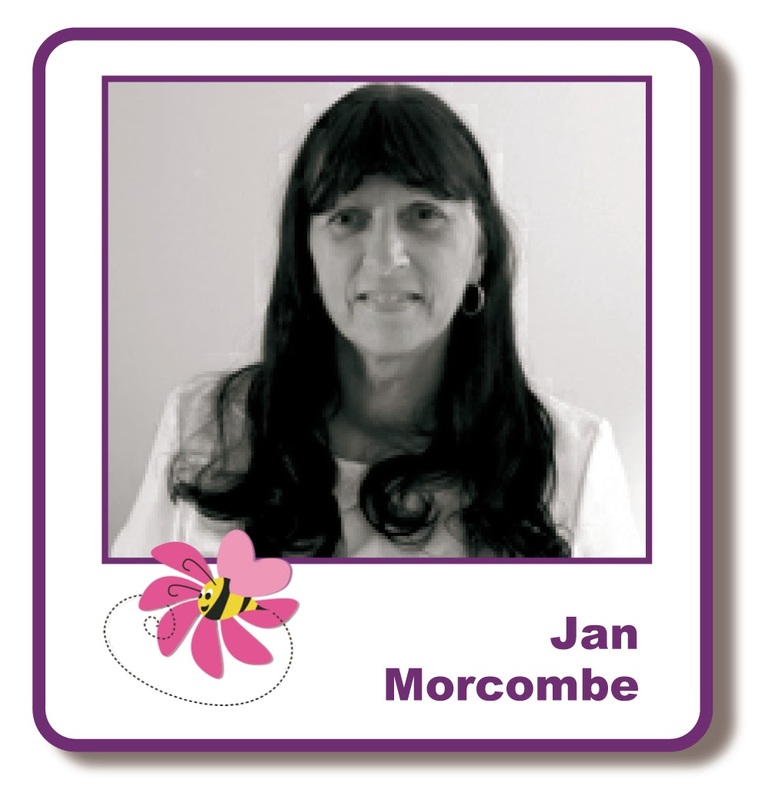 Jan, this is so lovely, adding the little heat embossed circles was a great idea.